Florida, with the exception of northern Florida, has long, hot summers and rarely sees snow; therefore, it may not be suitable for growing most cherry cultivars. 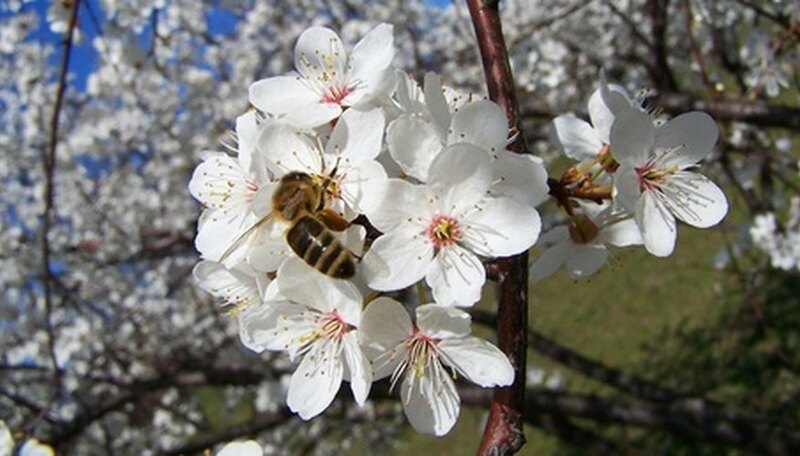 Insufficient winter chilling can cause cherry trees to develop poor bud-burst, flowering, floral abnormalities and poor fruit set. Fortunately, a few cherry tree cultivars that are tropical in nature can thrive in most Florida gardens. Barbados cherry (Malpighia glabra L), also known as West Indian cherry, is a popular garden cherry that originated from the West Indies 40 years ago. It varies in shape from a low and spreading habit to a more upright and open habit. A robust and bushy shrub that grows up to 20 feet high, Barbados cherry has elliptical, hairy, glossy evergreen leaves measuring from 1 to 3 inches; the leaves vary in shape from ovate to obovate. The small, attractive, pink or mauve flowers usually appear in April and continue to bloom throughout the summer. The succulent, bright-red fruits measuring 1 inch in diameter are thin-skinned and have acidic pulps that contain three triangular seeds. The three-lobed fruit are borne in leaf axils, singly or in two to three clusters. Barbados cherry is tropical or subtropical in nature and is suitable only to south Florida and the warmest areas of central Florida. Young seedlings die if the temperature falls below 30 degrees F. It adapts well to extreme heat, tolerating long dry spells with minimal rainfall. The plant prefers well-drained soil with pH level of at least 5.5. Check the soil for nematode infestations before planting because of its susceptibility for this pest. Surinam cherry (Eugenia uniflora) is a small, tropical tree indigenous to the Amazon rainforest. It often grows as hedges or dwarf trees, much like outdoor tropical bonsai trees. It can grow up to 25 feet tall. Ovate-lanceolate, deep green leaves turn red in the cold, dry winter. Leaves measuring 1 1/2 to 2 1/2 inches contain essential oils including citronella, cineole, terpenine and sesquiterpenes. Long-stalked white flowers have a tuft of 50 to 60 prominent white stamens with pale-yellow anthers. Fruits measuring 1 ½ inches are round, red to dark red, longitudinal grooved berries; they are very juicy and high in vitamin C. Some varieties produce dark-crimson fruits, which are sweeter. Fruits contain one to two large, light brown, round seeds. Keeping the soil loose around the hedges will allow the roots to spread. Surinam cherry prefers moist soil; however, it can tolerate poor, but well-drained soil. Preferring full sun to partial shade, serious damage to young plants will occur at 22 degrees F, or 20 degrees F for mature plants. Wild black cherry (Prunus serotina) grows in eastern to central and northwest Florida. It can reach 80 feet high and has branches that turn from green into reddish brown. Mature trees bear coarse bark that turn into brown as it matures. Simple, alternate, dark green leaves are 2 to 5 inches long, oblong to lance-shaped and finely serrated. Small white flowers in hanging, narrow clusters measure 4 to 6 inches long and bloom in late spring. Dark purple, round drupe fruits, almost black when ripe, measuring 1/3 inch in diameter have bittersweet taste and mature in late summer. Black cherry and its varieties grow under a wide range of climate conditions, some even surviving to as low as 12 degrees F. They are drought-tolerant, preferring full sun to partial shade, and grow best in damp, loose soil that contains a heavy dose of mulch.